The revolts on the Arab street have occasioned a renewed interest in the measurement of political risk. And businesses are paying greater attention to political risk analysis. Both are good news. But is it just passing interest, or will this result in real innovations in risk analysis? Typically, business analyses of political risk have involved a blend of political indices, such as those provided by Freedom House or the Heritage Foundation or the World Bank, with qualitative analysis focused on specific industries. While informative, these dwell on past and ongoing trends and events, which are then extended to forecast the future. What has lacked is real understanding of theory. Without it, we cannot understand causality, and without knowing “why men rebel” (the title of a classic political science book), we really cannot understand the risk of rebellion and upheaval, let alone forecast it. The point of departure of risk analysis, therefore, should be theory, especially theories of revolution. This is where political scientists, and social scientists in general, can make a real contribution to a field dominated by actuaries and financial forecasters. In this effort, The Economist made excellent inroads recently. Its humorous-but-apt “Shoe-Thrower’s Index” begins with theory, then garners related indicators, and then produces a risk-ordered list of countries in the Middle East. It’s not complete, but it’s a great start. The Shoe-Thrower’s Index identifies several factors as causal in the chain of rebellion. All these are established by the social sciences. It then attaches different weights to the factors, as shown in the table. The higher the total for a given country, the greater its risk of political instability. According to this, Yemen, with a score of over 80, is the riskiest country in the region. Next are Libya, Egypt, Syria, and Iraq, all with scores of over 60. UAE, Kuwait, and Qatar are at the lower end of the spectrum. There are two main weaknesses in this index. First, as The Economist itself admits, it discards factors that are “hard to quantify,” including unemployment information because they’re not comparable across the countries in the region. This quantitative bias is typical of many risk approaches. More qualitative factors such as ideological motivation or support (such as between Islamism or secularism), leanings of leaders (such as between non-violence or violence), leanings of the armed forces, control over governmental employees, and ideas of justice/injustice are important predictors of not just the occurrence of instability but the duration and extent of it. The Economist also overlooks the fact that some of the indices it uses as sources of quantitative data, such as those of corruption or democracy, are really qualitative information, drawn from people’s subjective perceptions or opinions. These are merely disguised and presented as quantitative data by attaching numbers to survey responses. Pronouncing a flat-out preference for quantitative data, therefore, is misleading. The second important factor, which can be both quantitiative and qualitative, not included in the index is “resources.” Political scientists have shown that revolts, and specifically democracy movements, are critically dependent on organizational, technological, and infrastructural resources available to protesters. Simply put, without access to technology, such as Twitter, Facebook, or satellite TV channels, all the other “factors” may not have produced the type of instability that is sweeping through the region. Resources allow isolated show-throwing to snowball into concerted political upheaval. In any case, the type of risk-indexing exercise that The Economist undertook is definitely a solid step in the right direction. 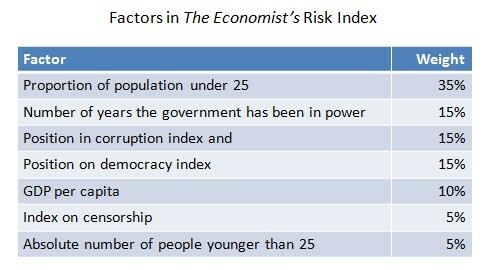 To further improve our understanding of political risk, we need to start weighing in additional qualitiative factors.